The current diplomatic moves of the new regime of Sri Lanka, after deposing Mahinda Rajapaksha from his decade-long throne, imply that Sri Lanka has once again adopted India as its prime foreign policy ally. Even the Indian media is very positive about this unprecedented democratic upsurge. Does this climate augur good yields for India? This is too early to infer but more about this sooner or later. Following the groundbreaking victory of Excellency President Maithripala Sirisena who defeated the invincible personality of his predecessor, Indian Prime Minister Narendrn Modi, was the first one to extend his wishes to the President and promptly invited him to pay a visit to India. In return, the new President stated that his first foreign visit next month would be to India and his foreign policy would give India a prominent place. 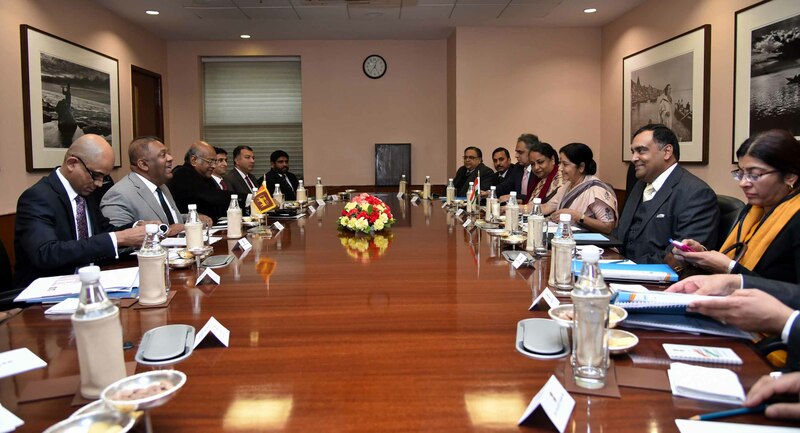 In another event that affirms India’s continuous solidarity, India’s envoy in Colombo Y.K. Sinha in person showered his well-wishes on the President. In contrast, Wu Jianghao, China’s ambassador could meet the president rather very late after his victory. The first foreign visit of Mangala Samaraweera to India, after assuming as the External Affairs Minister marks the age-old rich significance and cooperation reserved in the agenda of Sri Lanka. What the new government’s approach towards India showcases is the resurrection of the traditional bond shared between them and the withdrawal from the policies of former President Mahinda Rajapaksha whose reign maintained strained ties with India owing to its continuous display of pro-China tilt. Ranil Wickremesinghe, the Prime Minister has in an interview to NDTV said “The strategy of the former president Rajapaksa to play India against China and vice versa came a cropper”, and the new government would review the feasibility of all heavy investment-laden foreign contracts, especially the Colombo Port City project where land for this mega project will be reclaimed from the sea. This mega project is anticipated to be a milestone in China’s conceived Maritime Silk Road. Like India, China will be closely looking at the unfolding events owing to its deep-rooted interest in the geopolitical location of the Island in the Indian Ocean which is what takes no change no matter whatever miracles take place. Indian policy makers will make a blunder if they think that a change of regime, which still leaves ripples of shockwaves in the country, makes both Sri Lanka and India freer because new development eclipses the exposure of China in the Sri Lankan soil and leaves a greater say to India. What culminated the voters’ power is not necessarily marked by their resentment over China rather their long-whispered allegations of nepotism, opacity and corruption the previous government wallowed in. China’s role in terms of infrastructure development and investments is engraved through out Sri Lanka. Its money and muscle power and lust for power in the Indian Ocean through its String of Pearls Strategy keeps its motive revived in the Island and entices the high-rise ambitions of the Sri Lankan economy. India alone can not compete with China as she herself receives monetary benefits from China. Looking at the footprints of China, its leverage would only fatten in the Island. Thereby, India, keeping the newly developed harbinger in its mind, should efficiently deal with the Island to regain its alienated status without having to place its domestic politics in jeopardy. Aiyo!! Deviyo Saakki!! Were Leaders Praying Or Taking Insurance Against Lightning Strikes? Siamese Twins: India And Sri Lanka? or are they Para-Twins and Siblings? For China, Sri Lanka is is one of many out posts. For India, it is a neighbor and few “allies”, if one can call like that,. We need to be neighbourly but we cannot forget the role played by India by helping LTTE. Giving them the space to train their cadres. LTTE would have been insignificant factor if not for the place given by Indira’s government. Its a complicated relationship with IPKF and the attitude changes in the post rajiv Ghandi murder. It has to be a cautious move by the new Government. Foreign Policy is important. It must further Sri Lanka’s interest. We cannot afford to be unpleasant with any nation neither are we in a position to please everyone. Sri Lanka must steer through a diversity of interests of various competing nations looking for strategic locations, strategic alliances etc. NOT AN EASY TASK. We are twins in other ways also. Most of the Sri Lankan politicians came to power championing racism. Not many people are in illusion as to what brought Modi to power – pure racism. Wasn’t there any Straight guys.in the CT’s Royal List to represent us on the Foreign Stage?. Specially on India Turf, which produced the great majority of our Sinhala Buddhist population, which has managed to protect and propagate Buddha’s teachings for over 2500 years. First and foremost the Buddhism practiced by the Sinhalese is an insult to the true preaching’s of Lord Buddha. The Sinhalese are converts to Buddhism thanks to Sangamitta Thera from India. Buddhism is not about planting Buddha Statues in every street corner, by the side of dirty drains, next to meat/fish markets and alcohol shops or close to other locations of other religious worship creating disassociation and a nuisance. Buddhism is not about planting Buddha Statues by three wheeler drivers and administration of the same by such low caste principled yakko type fellows. Buddhism is not about blasting pirith on loudspeakers desecrating the silence of the environment. The statue of Lord Buddha is not a Christmas tree for an ignorant shameless population of Sinhalese to decorate with sparkling colorful lights to gain attraction. Buddhism is not a pedestal for a group of Mahanayake theros to create divisional politics and caste based nikayas such as the Siam, Malwatte, Asgiriya that play and pander with the dirty politics and racist policies of Sinhalese political leaders such as SWRD Bandaranayake and very recently Mahinda Rajapakse. Buddhism is not about these Mahanayake Theras to keep conveniently silent when thousands of Tamils were being murdered on the basis of patriotism and heroism in riots of 1915, 1956, 1958, 1977, 1983 and finally State genocide of 2009 by Sinhalese and only make an issue that Lord Buddha’s photographs need to be banned from being published in Newspapers because fish and meat or alcohol can be wrapped in the those same newspapers. Buddhism is not about banning meat and alchohol and even theatres on Poya days while Sinhalese are seen ganging up at supermarkets and shops the day before filling their larders with meat and alcohol. When Rev. Sangamitra Thera converted these uncivilized Sinhalese to Buddhism, little did he realize that these monkeys would one day abuse and use this religion as a tool for criminalizing society and manipulate the same for religious intolerance and racism. It is sad that India, being the true land of Lord Buddha and having the most exemplary Buddhists of the world fails to make a statement of the level of abuse and shameless indiscipline that is perpetrated by the Sinhalese in the name of Buddhism in Sri Lanka bringing untold shame on this great son of India Lord Buddha. Therefore, Sinhalese are just a shameless race that lives on stating that they are Buddhists to show the world that they are civilized but actually otherwise. The UN reports and the new UNHRC resolution show ample proof of this. Presidents might visit, yes there are Tamils in Sri Lanka but ‘Siamese Twins’ we are not. My grand father’s grand father’s grand father stood on the land bridge with a mammotty. He was trying to test an idea that he can get a lot of pearls by draining the sea to the north of the sand bank. It took him only one day but as he worked hard for the sea water to break through he too got washed away. And the rest of the history was fixed by historians and geologists in Oxford who were asked to do so by Commander A.D. Taylor. Thats how connected up everything is to now. Stop repeating whats fed to you. India and and this little island off India are the same. India and Andaman islands are not the same.